I had intended to make a glut of this stuff about 2 months ago with all the tomatoes I was definitely going to have at the end of the summer. Then my tomatoes, all 13 plants got blight and swiftly died one after the other… I am not afraid to say that there was a serious sense of humour failure under this roof. Not only because they had dies after all the love and attention that I had paid them, but also because I had been really looking forward to making tomato chutney. 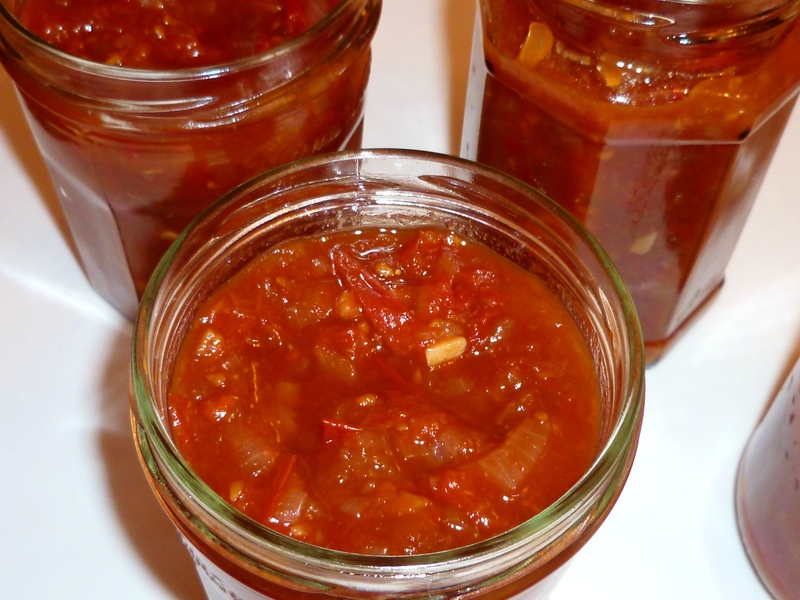 I first tried homemade stuff at a friend’s wedding, we each got a teeny little jar of tomato chutney as a favour and it was gorgeous – this was about 2 years ago – I’ve been wanting to make it since then. I’ve stuck quite close to a GoodFood recipe adding a few extra bits to give it a bit of welly, but it goes simply like this. Taste (be careful it will obviously be very hot) and add more of anything that you think it needs – possibly more Guinness – so don’t drink all the remaining can before you reach this point! This will apparently last for 6 weeks, but given how much we love chutney in this house I can’t see that happening! It’s not a short recipe but it’s so easy and is so worth it. So glad i came across this. We’re having a frugal Christmas this year so i’m making chutney so family. I’ve looked at a few recipe, but will be making this one for sure. It look delicious. Thanks for the great recipe! Luci. I will certainly be giving some people these for Christmas – I made a load of marmalade that weekend as well so my frugal Christmas is going well so far! I would probably suggest putting more guinness in than I did – it’ll give it more substance and depth of flavour. Good Luck – hope it goes well!